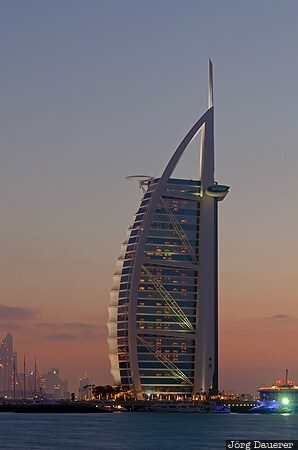 The luxury hotel Burj Al Arab off the Jumeirah beach at the Persian Gulf is one of the landmarks of Dubai. It is seen here flood-lit in front of a colorful sunset sky at the blue hour just after sunset. Dubai is the Emirate of Dubai, United Arab Emirates (UAE). This photo was taken in the evening of a sunny day in March of 2012. This photo was taken with a digital camera.